In a Twitter exchange with Nancy Pelosi's daughter, Iran’s foreign minister says his country no longer denies the Holocaust. Iran’s foreign minister said this weekend that his country no longer denies the Holocaust, or at least that the man who denied the Holocaust is no longer leading his country. Huffington Post is reporting about an interesting Twitter exchange between the foreign minister, Mohammad Javad Zarif, and the daughter of U.S. House Minority Leader, after Zarif joined Iran’s President Hassan Rouhani in sending Rosh Hashanah wishes to the Jewish people. Zarif tweeted “Happy Rosh Hashanah” on Thursday, to which Christine Pelosi, daughter of U.S. House Minority Leader Nancy Pelosi, responded by asking Zarif point-blank how he reconciled the apparent welcoming of the Jewish population by the current Iranian leadership with the bombastic rhetoric of the past. “The New Year would be even sweeter if you would end Iran's Holocaust denial, sir,” Pelosi wrote, to which Zarif responded by noting that Iran had never officially denied the occurrence of the Holocaust, and that former President Mahmoud Ahmadinejad, who denied the Holocaust and openly called to wipe Israel off the map, was no longer in power. “Iran never denied it. The man who did is now gone. 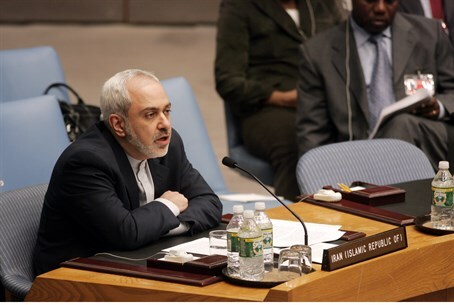 Happy New Year,” wrote Zarif, according to Huffington Post. Interestingly, Zarif soon deleted his previous tweet and replaced it another one which features carefully amended language. “Iran never denied it. The man who was perceived to be denying it is now gone. Happy New Year,” he wrote in the amended tweet. It would appear that while the foreign minister is asserting that Iran officially acknowledges that the Holocaust did, indeed, happen, he is also careful not to state outright that Ahmadinejad denied it in the first place. Meanwhile, Prime Minister Binyamin Netanyahu said Saturday evening that he is not impressed with the Rosh Hashanah greetings that Iranian leaders conveyed to the Jewish people. "The greetings come out of the mouth of a regime that only last week threatened to destroy the state of Israel," Netanyahu said. "The Iranian regime will be judged solely on its deeds, not its greetings, whose only purpose it to distract attention from the fact that even after the elections it continues to enrich uranium and build a plutonium reactor with the aim of acquiring a nuclear weapon which will threaten Israel and the whole world."